If you could imagine David Bowie, Peter Murphy and Nick Cave collaborating with John Barry, Burt Bacharach and Hal David together in the ’60s for a James Bond film, the result would be this record by the Dutch musician and composer Stephen Emmer. Produced by the great Tony Visconti (Bowie, T-Rex), International Blue is a remarkable work that harkens back to ’60s exquisite lounge and cinematic pop music of Swinging London and yet simultaneously sounds fresh in these times. 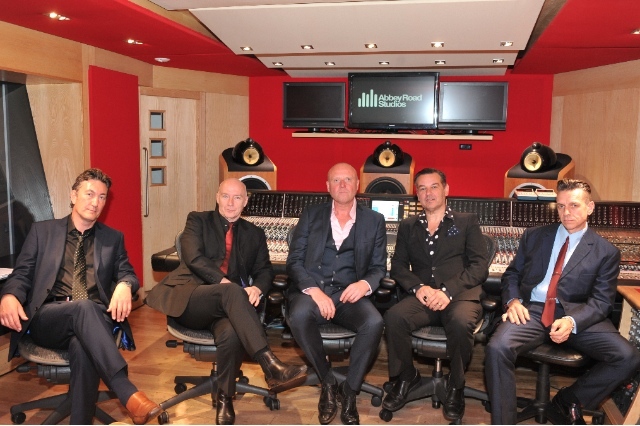 The album features a rotating cast of featured guest singers that include Heaven 17’s Glenn Gregory, Ultravox’s Midge Ure, Liam McKahey and Neil Crossley – all of whom give voice to Emmer’s romantic, melancholic and yearning compositions. The opening track “Let the Silence Take Hold of You,” sung by Gregory, is reminiscent of an unreleased track from David Bowie’s 1976 masterpiece Station to Station for its majestic and grandiose overtones; Ure’s take on “Taking Back My Time” sounds like ’60s cinema music crossed with Goth; “Songs for a Deserted Wife” performed by McKahey is a perfect throwback to a classic Bacharach/David tune with its soulful and yearning romanticism; and Crossley’s “Seachange” is a haunting and dramatic ballad. Emmer’s keyboard playing dominates this album, adding sort of an elegant and classical sensibility to the proceedings, and is accompanied by very tasteful and lush orchestral arrangements. International Blue is a gem of a record that makes you long for the time of perfectly-crafted orchestral pop music from nearly five decades ago.